With a very classic type of charm, the 4 x 4 Julia Axi Playhouse is one of the most gorgeous looking playhouses. This is something that is ideal for both boys and girls and its style is going to look great in any type of garden. The playhouse offers the kids plenty of room to host a tea party, play with their friends or even grab the iPad and watch a movie in the privacy of their own little home. With a very attractive door that has a window and letterbox along with a lovely apex roof and a set of opening windows. This really does have everything that is required to make a child’s dream home. 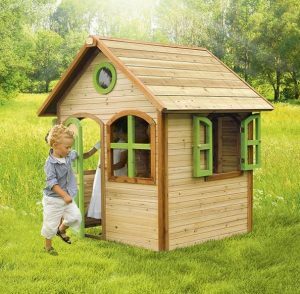 All the features of this playhouse have been very carefully and smartly chosen so that this lasts as long as the kids can fit inside and also so that it is safe and strong. The 15 mm thick tongue and groove shiplap cladding is joined by a very strong frame that keeps everything solid. Those lovely opening windows are made with shatterproof acrylic to ensure there is no broken glass. This is the type of playhouse where you know that the kids are not only going to have a fun time, but also be safe as they play. While the term Wendy House may be a little bit out of date these days, the 4 x 4 Julia Axi Playhouse is the kind of playhouse people are talking about when they say Wendy House. 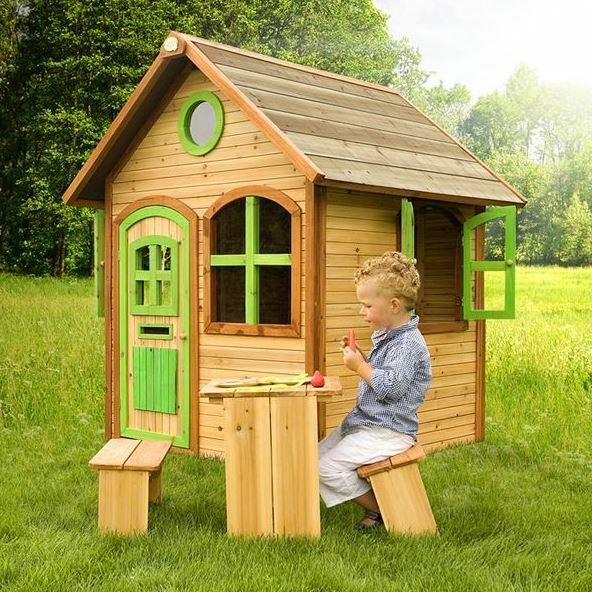 This is charming and just generally lovely playhouse that is going to be something the kids love to play with. You will get a real kick out of watching them play house with their friends or even their best stuffed animal. 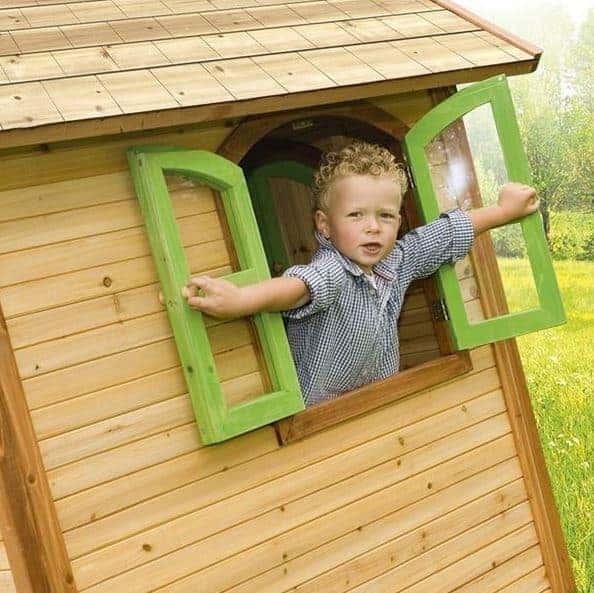 We really like the shape of this playhouse as it has 3 feet 11 inches of depth and 3 feet 10 inches of width. For a kid this feels like a huge amount of space and they will be able to put a table, some chairs and of course a whole lot of toys in here. One of the most impressive aspects of this playhouse is just how much headroom there is. With there being 5 feet 8 inches of headroom this will last the children for many years as they grow. We are sure you have noticed how fantastic that apex roof looks and we can tell you that it is every bit as robust as it is pretty. Rather than use some kind of felt like most other manufacturers do, Axi have gone for some very nice tongue and groove boarding for the roof and it really does have quite the amazing look. The timber used to make the cladding is very high quality stuff and it also gives the playhouse a very smooth look. Tongue and groove shiplap cladding is one of the best styles of cladding when it comes to providing a waterproof set of walls. Incredibly they have managed to make these 15 mm thick without having to increase the price a whole lot. By having the frame be 38 mm thick and also be planed smooth, they have ensured this is a structure that is going to last many years and also be able to take quite a bit of a beating from the kids. So no matter if one of the girls tea parties turns into some kind of dancing competition or if the boys start to have some kind of superhero rumble, this frame will make sure the playhouse can take it. The flooring is rather tough to talk about as you can see from the picture it all depends where you place this. So while you can put it on grass and we are sure it will be fine, we think that some kind of flooring even just some cheap wood would be better. Treating the timber is something you should do to protect it from rot. It is so easy to keep putting doing this off until the next weekend, but we always think that the first coating of treatment should be applied within the first week. Also a new coat on a yearly basis is something you should do if you want to make certain that timber keeps on looking good. The warranty that you get with this playhouse lasts for five years and will cover you in case of rot. The door on the 4 x 4 Julia Axi Playhouse is probably the first thing most people will notice about this playhouse. Axi have given it a very charming style with a nice trim and decorations on it. They have even put a little letter box on there so you better get used to writing the kids letters because we are sure they will always be checking for mail. Actually this could be a great way to get rid of all the junk mail that comes through your mailbox. There is also a very attractive Georgian style window on the door as well. There are four windows on the playhouse each of these is made with top quality acrylic glazing and is shatterproof. The window on the front is a fixed window, but the two on the sides can actually open. These open and securely close thanks to a clever use of magnets which the kids will easily be able to operate on their own. The last window is this lovely little circle one that sits high on the front of the playhouse and is sure to let in a lot of natural light. The door may not be able to be locked, but that is no surprise as this is the case with the majority of children’s playhouses we have seen. The door does firmly shut and as long as the door is kept closed then it will not be banging in the wind. 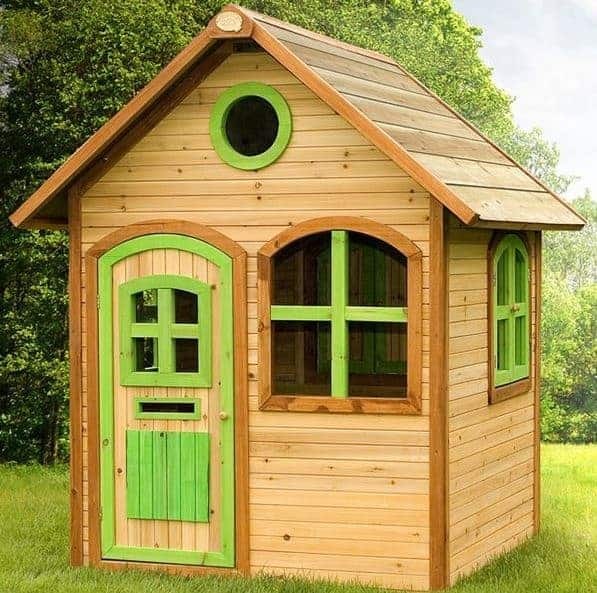 This is actually one of the more secure playhouse that we have seen and if you did want to increase the security then a pad bolt or lock could be easily added. 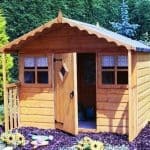 Due to the design of the Georgian style windows this does offer more privacy than most other playhouses which is a nice bonus. You will find that the kids really do not care about privacy and if anything they want people to come and see their playhouse. 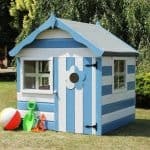 This is a wonderful looking playhouse which is a good thing as there is no option for customisation. Sure you could always give it a different coat of paint, but we feel the way it looks once built is good enough. 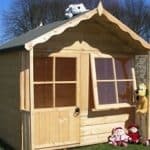 Some interesting extras are available for this playhouse with the most interesting one being the playhouse solar kit which costs £74.95. This is some space age kind of stuff as it goes on the roof and provides solar power to the playhouse allowing the kids to have an iPad, CD player or some other kind of electrical device inside. If you want to jazz up the outside a little bit then you can do this with the plant and flower box which can be added for £34.99. A fun chalk board can also be added so they kids can leave notes, write down what is for dinner or just draw silly pictures this costs £39.95 which we feel is a very fair price. Another extra is an anchoring kit which will allow you to secure the playhouse to the ground this will cost you a fairly reasonable £54.95. 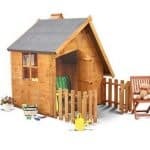 We really cannot think of anything bad to say about the quality of this playhouse as it really is very well made. Axi have used very solid and strong materials with this playhouse and it is so strong we can see this lasting for their whole childhood. 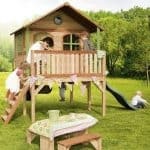 We feel that the 4 x 4 size of this playhouse is ideal and It will be more than enough for all kinds of fun and games. You will not have too many issues when building this as long as you follow the instructions and do not fall out with the person helping you build it. 4-6 hours we would say is the average time it takes to build something like this. 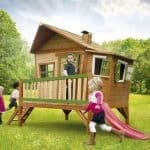 This playhouse does have a lot of style and while it may be a little higher than other 4 x 4 playhouse we feel that the high quality of this does make it worth that extra money. Final Thoughts: We knew from the very first picture that the 4 x 4 Julia Axi Playhouse was going to be something we really liked and as soon as we learned what materials they had used to make this, we knew Axi had a winner on their hands. This is one very solid playhouse. We know that its gorgeous looks may make some feel it might not be all that robust, but we assure you this is going to give the kids many, many years of enjoyment. We do wish that they were a little clearer on what the deal with the floor in this playhouse is, but no matter what, we are sure this is going to be something that makes you and the kids very happy.